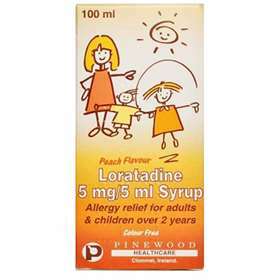 Loratadine 5mg/5ml Syrup - Allergy relief for adults and children over 2 years of age. Loratadine provides relief in adults and children over 2 years of age from the symptoms of hayfever such as sneezing, runny rose and burning itching eyes. It may also be used for skin allergies such as rash, itching and hives. Adults and children over 12 years of age - 10ml of the syrup once daily. Children 2-12 years of age with: body weight more than 30kg - 10ml of the syrup once daily. Body weight 30kg or less - 5ml of the syrup daily. THIS MEDICINE SHOULD BE ADMINISTERED WITH CAUTION IN THOSE WHO HAVE LIVER IMPAIRMENT. LORATADINE, PROPYLENE GLYCOL, GLYCEROL (E422), SODIUM BENZOATE (E211), CITRIC ACID MONOHYDRATE, SUCROSE, PEACH FLAVOUR AND PURIFIED WATER. Please Note: All generic products may change manufacturer from time-to-time so the packaging may not be as displayed above.